Recently I told you about the looping problems I’ve had when machine quilting. Even with the tension good — top and bottom threads balanced so they meet within the quilt sandwich — there’s been some extra loops appearing on the back of the quilt. Though no loops would be best, an occasional loop is likely to happen and is something I can shrug off. However, a lot of loops in a small area is messy looking and structurally not stable. It shouldn’t happen, and if it does, it is a problem to be fixed. I took my bear’s paw quilt off the frame and put on a test sandwich. When a lot of effort and adjustments didn’t lead to the quality I want, I took the machine to the factory and worked with a technician to get things fixed. When I brought it back home, I tested the machine again by quilting a table runner. Things looked pretty good, but I still didn’t feel very confident. At that point I decided to mount my Christmas quilt on the frame. This quilt is not intended as a gift, so the stakes were not very high. 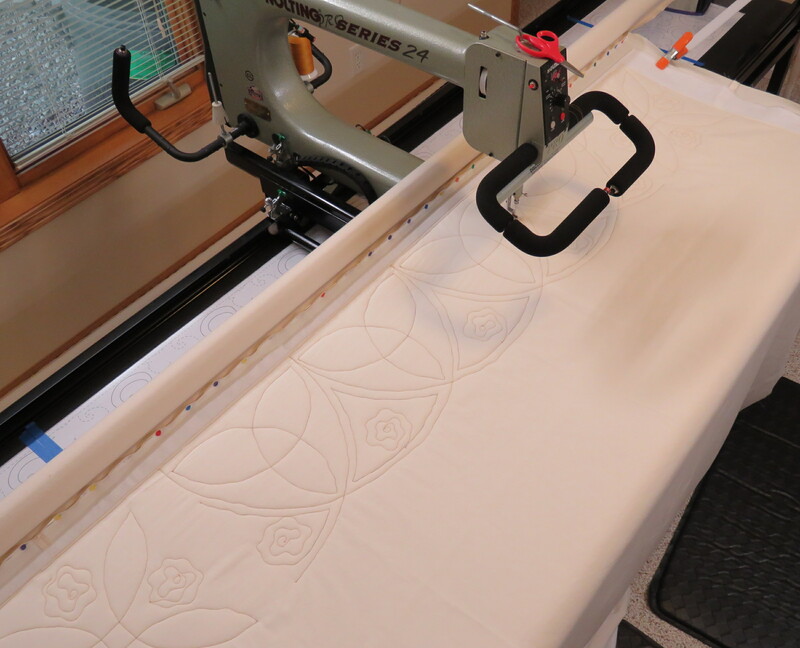 I use free-motion quilting for most of my quilts. What that means is I guide the machine stitching by hand, without a pattern or a computer program. Also, for most of them I do an edge-to-edge or allover design, rather than choosing different designs for separate borders or other segments. 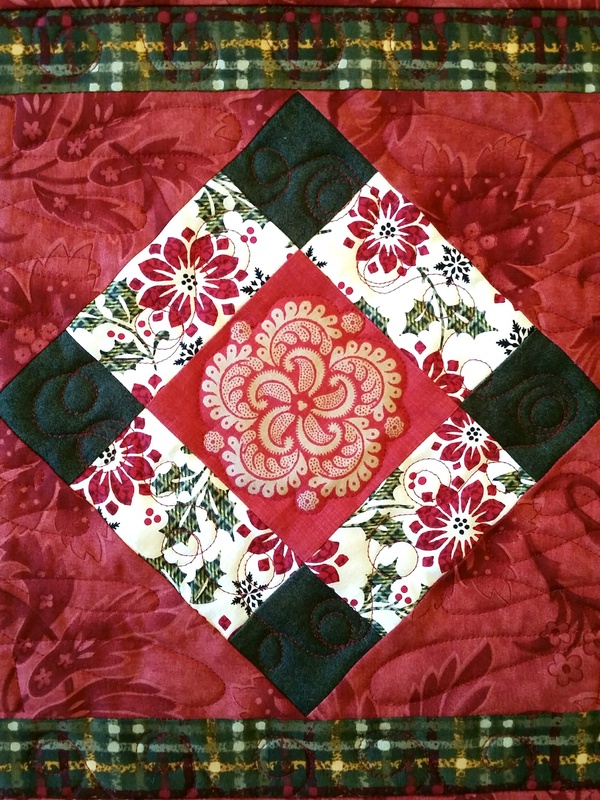 This quilt, called “Christmas Is Coming!”, didn’t warrant special quilting, in my opinion. The design impact is in the fabric and piecing, not in the quilting. 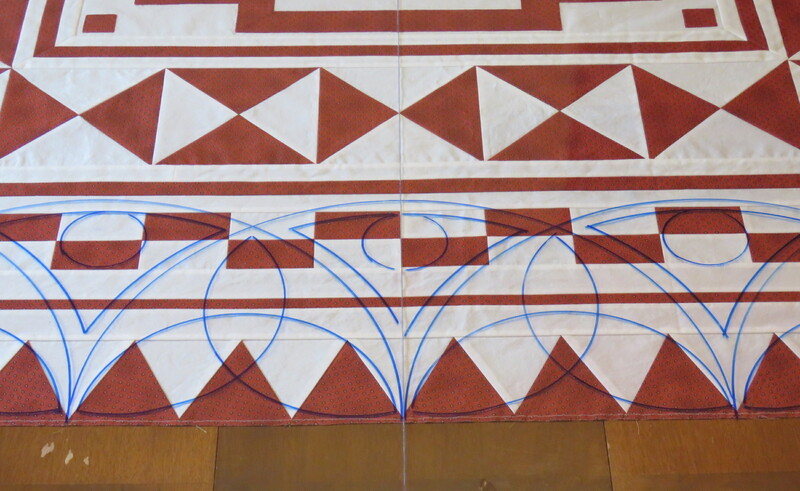 I often use a great big double meander — cross the quilt surface once with a big meander, and then cross back the other way, ribboning in and out through the original stitching line. Doubling the line allows you to fill more space if needed by sweeping out a little farther from the first line, or tracking closer where stitches are nearby. It creates a nice, soft texture, and it’s super easy to execute. The double meander seemed like a low-risk way to test my machine again. If there were unacceptable looping, unstitching would be relatively easy because of the open design, and restitching would be simple, as well. Christmas Is Coming! 67″ x 67″. December 2017. Photo by Jim Ruebush. The quilting was easy and the stitches were generally of pretty good quality. There were a couple of small areas with a little messiness on the back, but they were limited and very close to the edges. I decided to ignore them. Once quilted, I added the green binding with machine stitching to finish. There’s so much I love about this quilt. 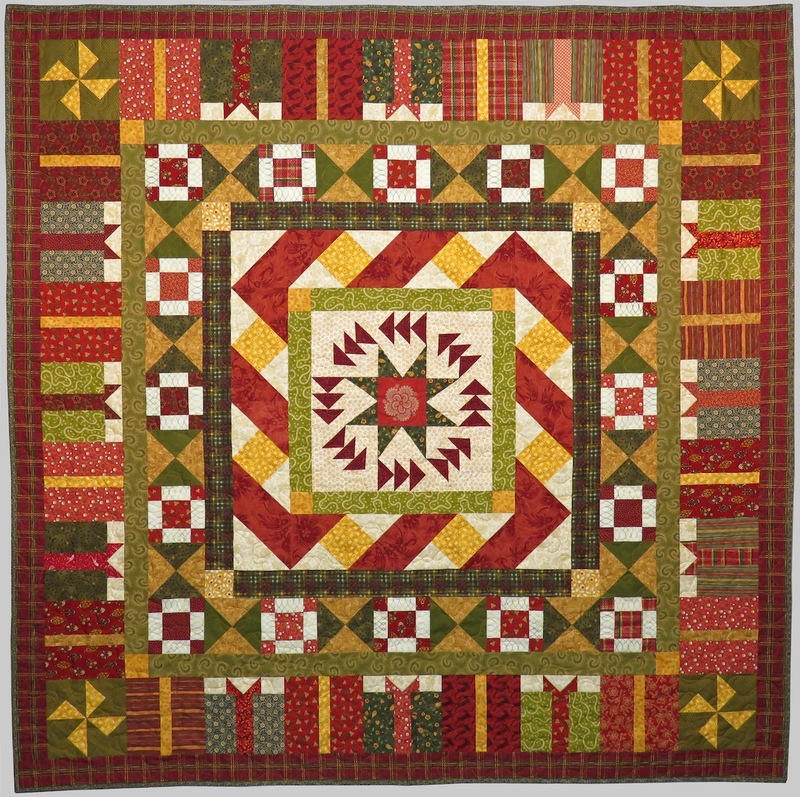 The twisting red and gold ribbon border, the green packages with red bows in the last pieced border, and the dizzy geese block in the center all add to the festive look. I love so many pretty fabrics, few of them designed and sold as seasonal ones. I enjoyed using up a lot of scraps to complete the packages and the puss-in-the-corner blocks. And I really like the Y-block pinwheels in the corners. And it was fun to make. Over all it really works for me — you could say it’s the complete package!! If you’d like to see more pix of this project before it was quilted, you can find them here. Once this project was off the frame, I started again on my bear’s paw quilt. Unfortunately, things didn’t go as well, and I stopped. For right now, the project is waiting until I can get back to it. That won’t be for several more days. Hopefully at that point, things will go better and I can get the quilting done. 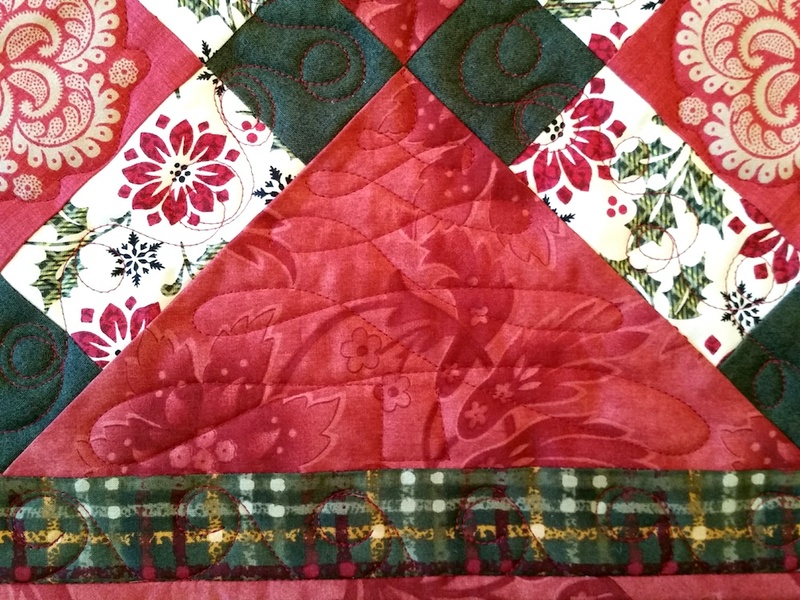 This entry was posted in Medallion Quilts, Quilting and tagged Longarm quilting, Machine Quilting, Process, Progress on December 10, 2017 by Melanie McNeil. Right now I have three quilts in progress. Two are from my medallion class. Christmas Is Coming! needs binding attached. The other is the bear’s paw quilt, which is still on the frame. Well, in fact, it is AGAIN on the frame. It is again on the frame because I’m having thread tension trouble on my longarm. Remember this? This was the worst of it, but not the last of it. After struggling with getting the tension settings improved, I decided to take the quilt off the frame and putting a testing sandwich on. Prior to taking it off, I basted all the way around the edge, and also used great big stitches to baste through the body of the quilt. The basting stabilized the piece, so layers would stay put for returning to the frame later. My test sandwich got covered with stitching. I managed to get the top and bottom tension adjusted well, but still had intermittent messy looping areas on the back. When the tension is BAD and there is looping, it’s because the tension is bad. When the tension is GOOD and there’s looping, it’s often because the thread is catching somewhere, like a rough spot in the thread path. I’ve done this long enough to know some of the places to look. (I have a long list of them, if you are interested.) I worked through all those things that I could. While it improved, it still wasn’t as good as it should be. I called the company and spoke with the head technician. He agreed I’d done all the right things and asked me to bring the machine to the factory. Fortunately, that’s only about a half hour away from me, so I took it the same day. After two hours working with a technician, the best we could come up with was replacing an inexpensive part, the last thread guide above the eye of the needle. Before returning to my bear’s paw project, I wanted to test it again on something small. Son’s fiancee likes seasonal decorating and I hoped to make a table runner for her for Christmas. I figured that would be a good project to test quilt. After all, if there was looping on the back, it wouldn’t matter. When used as intended, no one would see the back! I tend to make things more, rather than less complicated. So I had to fight my instincts and make this a simple project. I made three puss-in-the-corner blocks with fussy-cut centers. (Yeah, I couldn’t go all the way to simple!) I set them on point and framed them with a border. I had a piece of appropriate fabric for the back. So I loaded it all up and quilted it. The last step on the table runner was the binding. I had just the right amount of just the right fabric. However, when it came to attaching it, I wasn’t sure how! All my quilts prior to this have had squared 90° corners. This also had 45° angles. Have you used them before, or other angles than 90°? This morning I watched a video tutorial that explained how. Here is my finished table runner. The table runner has the edge of red binding. Underneath it is another quilt on the table. Taking a couple of extra minutes to fussy cut the centers made these simple blocks look fancy. Can you see the figure-8 Christmas tree stitched into this setting triangle? Another easy way to make an easy project look more intricate. I’m off and running again. Thanks for reading! I always read comments and try to respond promptly. If I don’t get back to you soon, it’s because I’m offline. See you soon! 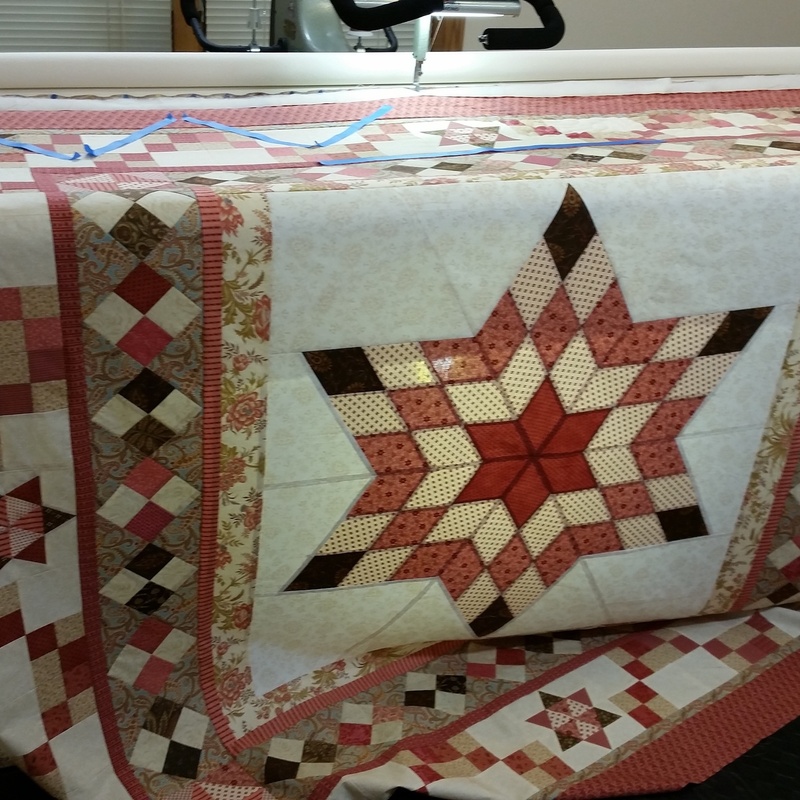 This entry was posted in Quilting and tagged Busy, Longarm quilting, Longarm tension, Progress, Quilt binding, Table runners, Tutorial on December 3, 2017 by Melanie McNeil. Last week I looked at some very old posts from this blog. One noted a handful of UFOs, including the 6-pointed star. I needed to set the points in background and then figure out what else to do. That was more than four years ago, and already it was a challenging puzzle. The quilt center is large enough, with the large background setting, that I decided to use a double layer of batting to set it off. That gave another challenge — how to use those remnants to show the center off, and also have fairly consistent loft and density through the rest of it. Big question: should I stitch all the batting pieces together before starting to quilt? Big answer: NO! It seemed like stitching would crush the edges. Instead I saved the piece I wanted for the center, and other than that, simply kept sliding in more pieces as I went. It was a pretty improvisational method, but it worked. You can see by the translucency in the photo below that there is no batting behind most of the quilt top at that point. For most of my quilts I wouldn’t have the patience or see the need for “custom” quilting. Instead I use some kind of edge-to-edge design, such as loops and leaves, or spirals, or all-over feathering. This one, again because of the large center star and setting, seemed to call for more special treatment. 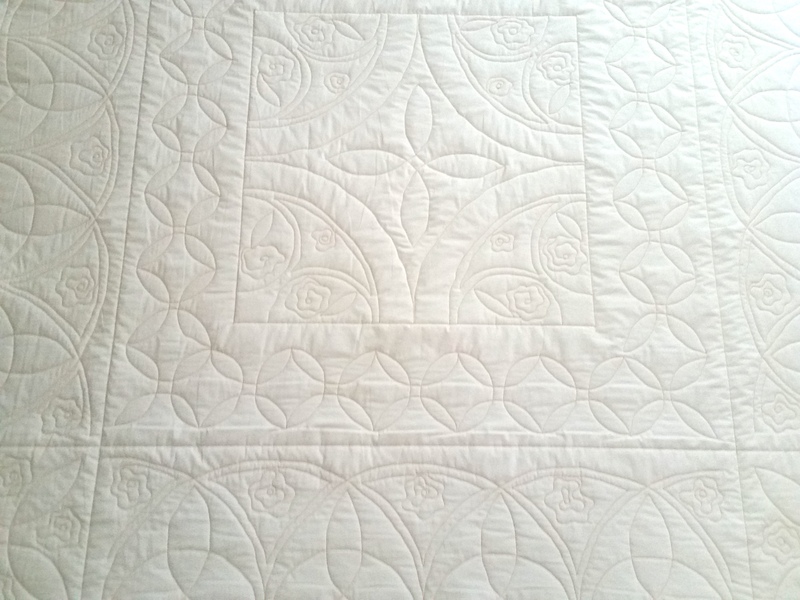 I used a combination of free-motion quilting and ruler work on this quilt. In the photo above you can see I used blue painters’ tape to remind myself of where I wanted to put feathering. The tape is easy to use and move and move again with no damage to the fabric. 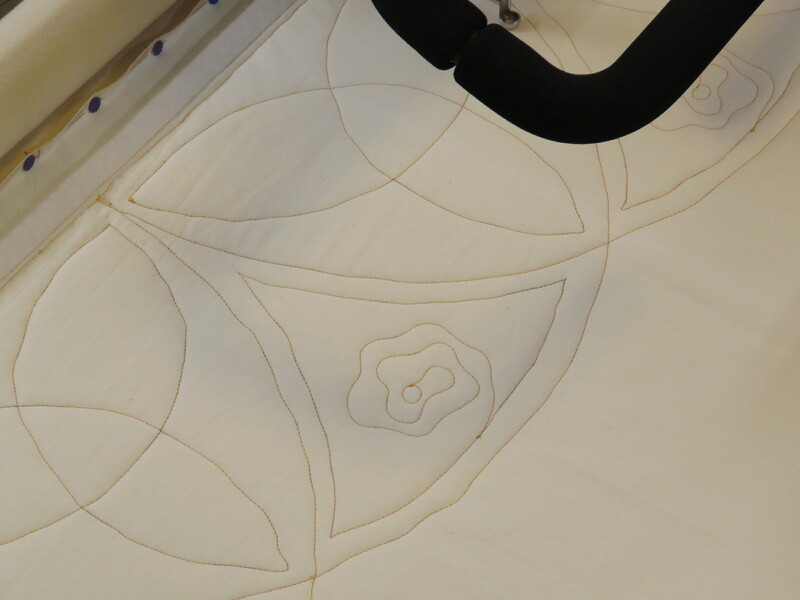 Here are a couple more photos of quilting in process. I did long feathering on the outer borders, and ruler work on the inner border of 4-patches on point. It was easy to do the “top” and “bottom” borders with continuous movement, because they run parallel to the frame. Doing the side borders was more challenging. There are two choices: 1) do the side border quilting in small sections, as I advance the quilt on the frame; or 2) take the quilt off the frame, turn it 90°, making the side borders now at the “top” and “bottom.” I did the second. Choosing the second method is easier in some ways and harder in others. 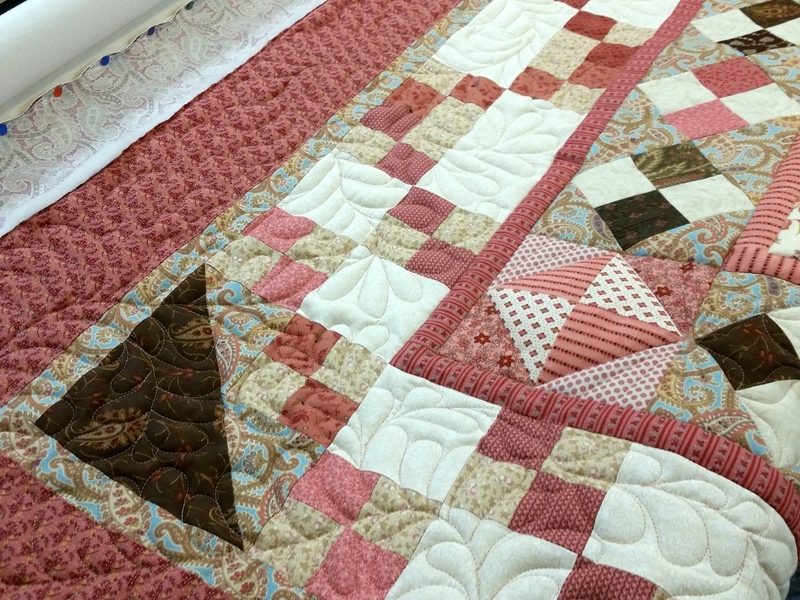 For example, it requires big-stitch basting through all the areas to be quilted after turning. The basting stabilizes and secures the layers, so they don’t shift and pleat with turning. When I got through the first time, I turned it and started again at the top. The quilt isn’t finished, as I don’t have binding on it yet. But here it is, quilting finished and off the frame. The first photo shows some of the detail, while the second gives the big picture. You can see in both of them that the wool, especially in the center, gives a lot of stitch definition and texture. I’ll finish with binding some day soon. And I need a name for it. (Any ideas?) Before that, though, I’m working on my class sample. I’ll show you progress on that soon. 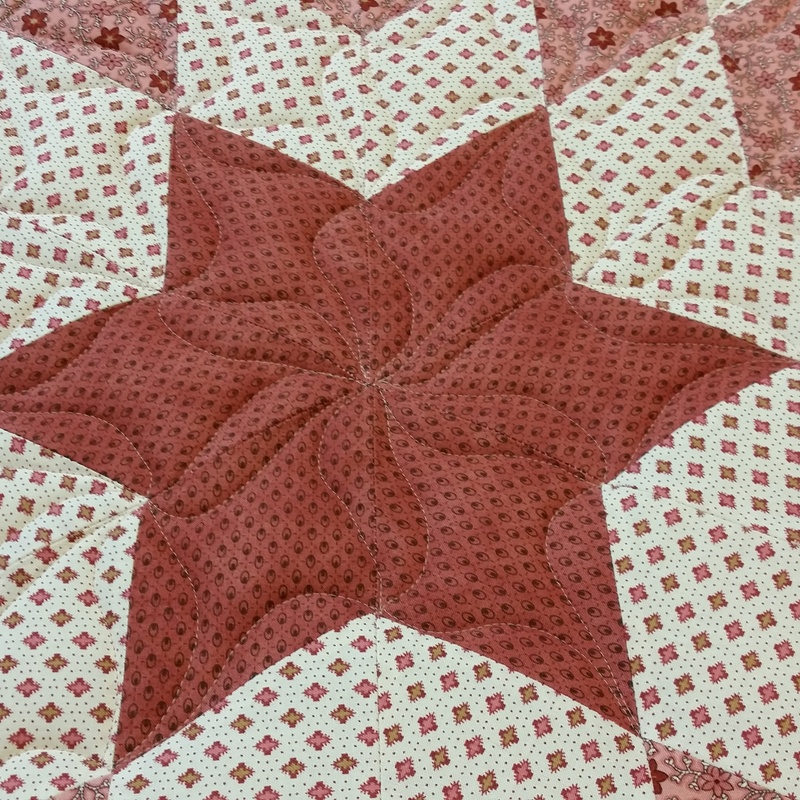 This entry was posted in Medallion Quilts, Quilting and tagged 6-pointed star, Batting, Challenge and opportunity, Challenges and opportunities, Longarm quilting, Medallion quilts, Process, Progress, Wool batting on August 25, 2017 by Melanie McNeil. I’ve been working on lots of parts of my quilty life the last couple of weeks. 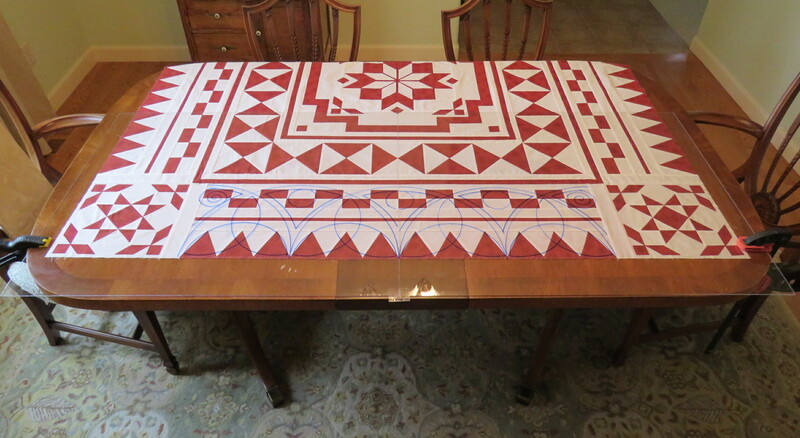 The biggest project has been toward completing my Fire & Ice medallion quilt in red and white. In my last post I described my intended process for quilting it. That process included designing the stitching, , transferring the design to Golden Threads paper, and quilting a muslin mock-up. It’s DONE! 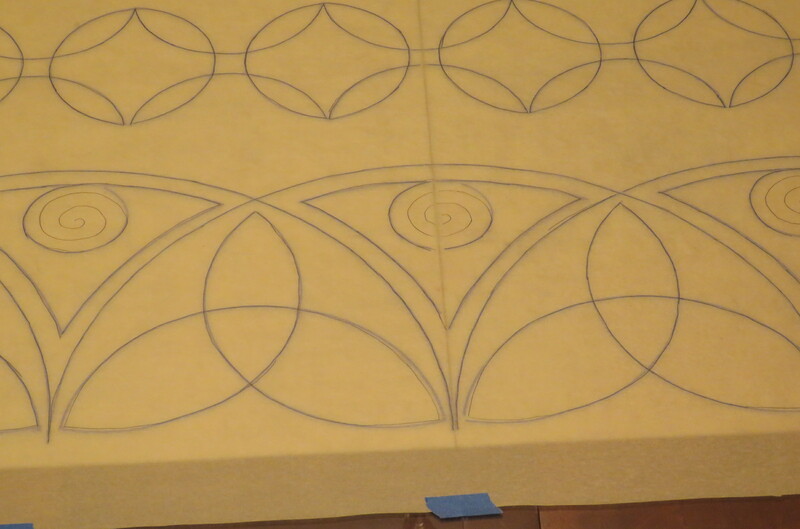 I think the design is very pretty and I hope it translates well to the pieced top. I was inspired by traditional Welsh quilting designs, as well as Gaelic/Celtic motifs. These photos give a sense of the design. Lighting is everything, isn’t it? And these should give some idea of the process. Jim was a big help in thinking through drawing and transferring the design. First we spread the quilt top on the table and covered it with plexiglass. Jim put a clamp on either end so the plexi wouldn’t slide while we worked with it. We experimented with different markers and methods of drawing arcs. You can see the outer border in these two pix. Once I was happy with the designs for the borders (outside border above, corner blocks, and the hourglass border,) we removed the quilt top and placed a piece of batting under the plexiglass. The batting was simply to put a light background under the plexi so the blue lines would show. Then I traced the designs onto the Golden Threads paper. I cut more pieces of paper to stack with the traced ones, and I stapled each stack together. The staples keep the pieces of paper from shifting. Each stapled stack of paper had the pencil tracing on top. I used a basting stitch and no thread in the longarm to punch the design through the whole stack. I made enough to do both the practice quilt and the real thing. 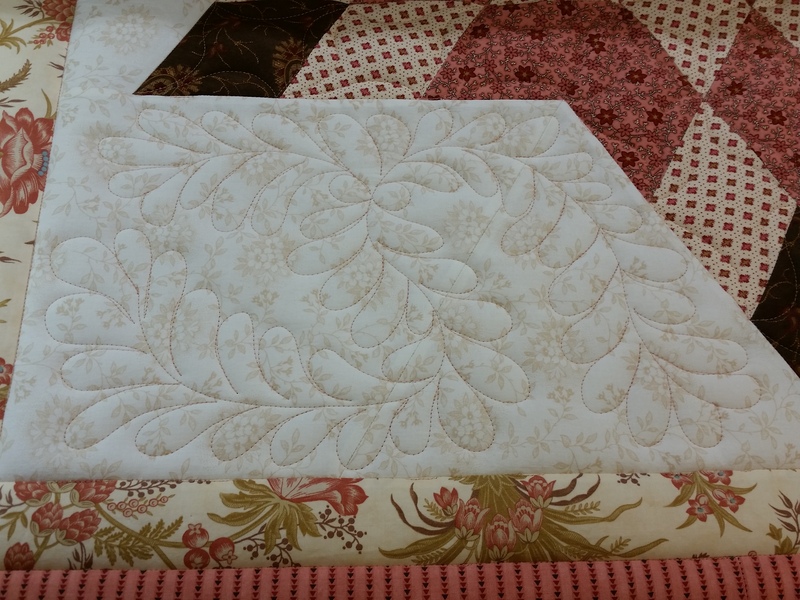 One thing I found was that pinning the papers to the quilt made the paper warp and pucker. After a couple of times like that, I simply stabbed long pins through, clear up to their heads. There were enough of them to keep the paper from moving much, and the paper stayed flatter to the fabric. Next to do on this project is to load the real deal, change the needle, change the thread to white, and get started quilting. The actual quilting time is not huge, so I hope to have it quilted by the end of the week. 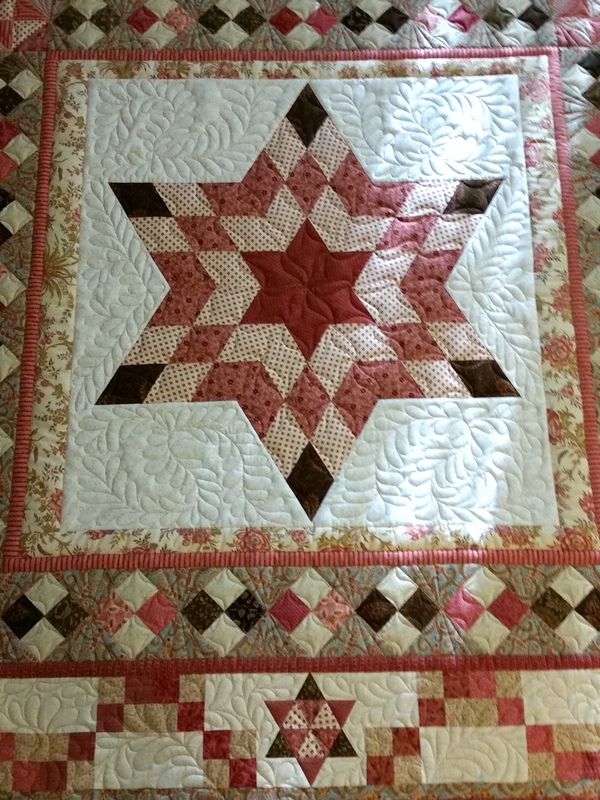 This entry was posted in Medallion Quilts, Quilting and tagged Challenge and opportunity, Design, Golden Threads paper, Longarm quilting, Medallion quilts, Original design, Process, Quilt guild, Red and white quilt on May 13, 2017 by Melanie McNeil. Remember the fun we have as the year turns, defining our resolutions or choosing a word of the year? For the last few years I’ve tried the “word” game. When it’s working well, I have my word in mind often, and consider how to move my life more in line with the word’s intended values. This year, I’ll admit, I haven’t thought much about my word. Actually, it’s two three words, “challenge and opportunity.” My intention is to see barriers or obstacles — and problems! — as chances for creativity and growth, and to face opportunities bravely, even when they are hard. But while I haven’t thought much about it, I’ve been living it. My quilty world has been rife with opportunities for growth, for re-engagement with my guild, for creativity in my quilting, and for cultivating speaking and teaching gigs. 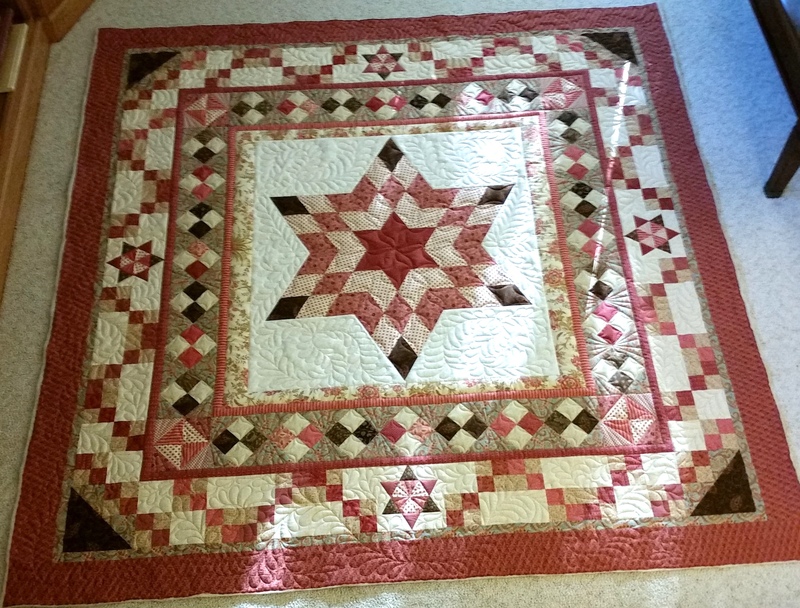 One personal challenge I set was to create a special red and white quilt for my guild’s upcoming quilt show. I’ve shown you the unquilted top already. Creating the top presented challenges of its own, including interpreting the original quilt in a way that would honor it, learning to paper piece those triangle borders, and appliquéing various parts of the motif. 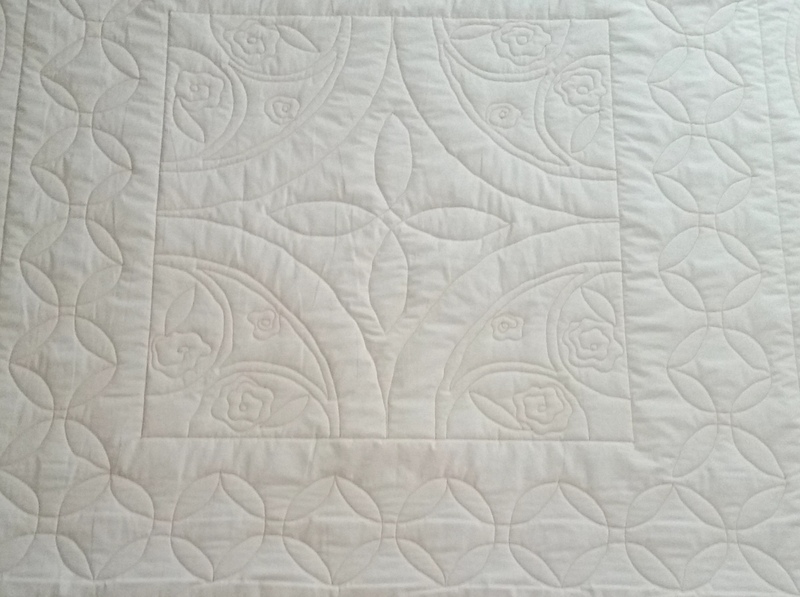 Originally I planned to have it quilted professionally. For various reasons, including encouragement from my brother, I decided to do it myself. As you can see, it is a challenge and an opportunity! Over the last couple of weeks I’ve been working on a plan, including both design and implementation. For the stitching design, I’m inspired by Welsh hand-quilting motifs. My draft includes double arches and spirals, among other traditional elements. Implementation is multi-steps. 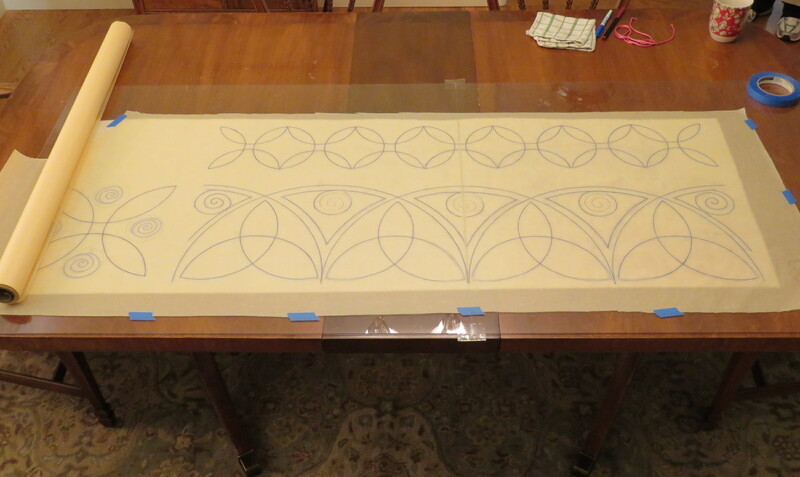 To start, I’m drafting the design with markers on plexiglass sheets, overlaid on the quilt top. I’ll transfer the design to a product called “Golden Threads” paper, a specialty tissue paper intended for quilting right through, and tearing away. If this works, it will allow me to avoid marking on the quilt top itself. I’d rather not, as I don’t want marking to stain the white fabric. I’ll test the Golden Threads paper with a first go, which will also allow me to practice the shapes. I have a muslin whole-cloth top the same size as the red and white top. It won’t have the same effect without the piecing, but I’ll be able to tell whether the whole plan will work or not. The muslin backing is loaded on the longarm frame, and I have batting the right size, as well as the top. Within a few days I’ll start quilting it. I’ll do the borders at each end (top and bottom,) and stabilize it through the middle with basting. Then I’ll take the whole thing off the frame and turn it 90°, reload it, quilt the other borders, and quilt the middle. IF it all works okay (learning as I go, I’m sure,) I’ll use the same process on the real deal. Wow. This is the perfect set-up for challenge and opportunity. Wish me luck. 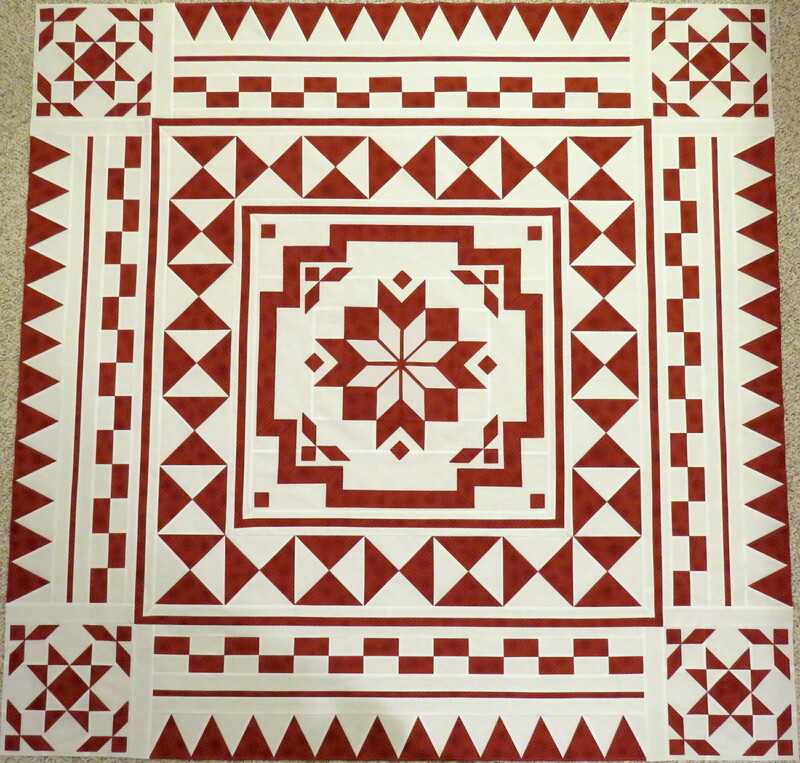 This entry was posted in Medallion Quilts, Quilting and tagged Challenge and opportunity, Design, Longarm quilting, Medallion quilts, Original design, Quilt guild, Red and white quilt, Word of the year on April 30, 2017 by Melanie McNeil.